The National Society Daughters of the American Revolution (NSDAR or DAR) is a non-profit, non-political volunteer women's service organization founded in 1890 by a small group of patriotic women. The DAR is dedicated to promoting patriotism, preserving American history, and securing America's future through better education for children. Nationally, DAR members volunteer more than 200,000 hours annually to veterans in Veterans Administration (VA) medical centers and non-VA facilities, offer support to America's service personnel abroad through care packages, sponsor programs promoting the U.S. Constitution, and participate in naturalization ceremonies. DAR members participate in various projects to help preserve the cultural heritage of the United States. Pennsylvania State Society Daughters of the American Revolution (PSSDAR) have supported the National Patriots Bell Tower in Montgomery County; the Fort Pitt Block House in Allegheny County; the Madonna of the Trail in Washington County; and the Rocky Spring Church in Franklin County, to name a few. DAR members are passionate about education through the promotion of the Children of the American Revolution (C.A.R. ), DAR Good Citizens, and Junior American Citizens; the provision of scholarships and awards to outstanding students; and the support of six schools through chapter and member donations. Over two hundred years ago, American colonists, sacrificed their lives and fortunes to "establish Justice, insure domestic Tranquility, provide for the common Defense, promote the general Welfare, and secure the Blessings of Liberty" and in doing so, left a legacy to the American people. 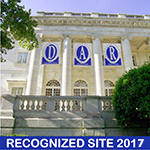 Membership in the DAR will allow you to perpetuate their legacies through supporting the efforts of the National Society by promoting patriotism, preserving American history, and securing America's future through better education for children. Any woman 18 years or older who can prove lineal, bloodline descent from an ancestor who aided in achieving American independence is eligible to join the DAR. This means that your ancestor could have provided food for soldiers, served in the military, served their town as sheriff, or provided medical aid to the wounded. Joining the DAR does not require an interest in genealogy, but it helps to have knowledge of your ancestry. To determine your eligibility, you will need to gather documents for yourself, your parents, grandparents, and possibly great-grandparents. With 94 chapters in Pennsylvania, the Pennsylvania State Society Daughters of the American Revolution (PSSDAR) has volunteers who can assist you if you need help with your research. Please visit the National Society Daughters of the American Revolution "How to Join" page. For questions, please contact our webmaster.